At the gym today, I saw a guy wearing a t-shirt that said something like "To do: Get up. Be amazing. Go to bed." I laughed at it, but later I got to thinking. Since it was a guy wearing the shirt, it might have been an ironic commentary on men with a tendency to think all too well of themselves. Or it might have been a straight-forward declaration of his opinion of himself. It doesn't matter. What I realized as I was biking away from the gym (because I have to be fit, and save the world from automobile exhaust at the same time), is that we women, maybe especially us moms, long since internalized that command. We feel like it is our job. Get up, probably earlier than we want, and hit the floor running. Breakfasts, lunches, get the kids off to school (for far too many this means driving them. I figure I'm doing something right, because I shove my teens out the door to get themselves to school), all while trying to ingest that all-important first cup of coffee. Then hit your "day job," whatever it might be. You'd better be amazing there, because whatever you do you'll be judged by a tough standard. Then home again (or in my case, stagger up from the computer) and be sure all the chores are done. That people have clean clothes. That the floor's been swept sometime this decade. And make dinner. Dinner's the worst. If it's healthy, someone's bound to snoot it. If it's not, they may eat it up, but you'll feel awful for feeding your family something that's not good for them. If your spouse or kid gets sick somewhere down the line, with anything from the sniffles to cancer, you'll know it's your fault for getting them take-out that night instead of cooking veggies and teaching them from infancy to eat them. Many of my fellow bloggers participate in the IWSG, the Insecure Writer's Support Group. I realize that I am more secure about my writing than most of my life. I may not be brilliant, but I can write. * I'm a great deal less convinced that I can parent. Motherhood offers so many opportunities to realize that you have completely, totally and utterly failed your children, maybe with the best intentions in the world. Or maybe because you know, deep down, that you are too lazy to ever be a good parent. The teen years are especially good for this. My oldest is a high school Senior. That means that this fall we are not only having to push him into thinking about picking (and applying to) a few colleges, but every time I read a list of what a kid should have done or be ready for at this age, I realize again that I failed to do that. On a good day, I can remember that I've done my best, and we were working with some challenges here, as Eldest Son is on the autism spectrum, being mildly Aspergers. Sometimes I don't believe it; sometimes it's so obvious. But on a bad day (and at my age, honey, you get a fair number of bad brain days), I'm pretty sure that a REAL mom would have made sure he knew how to do all those things. Would have gotten him involved in clubs and sports and probably directed him how to save the world before age 12. On a really good day, I remember that he is loving and creative and brilliant, and very little I can do will change anything anyway. Then I can go write. Because every day that I even sort of meet my responsibilities as mother, wife, writer, and schools advocate, and even sneak in a workout, I've been freaking amazing. *On the other hand, I don't know squat about marketing and am surely doing it all wrong. That's another post for another day. This is the 3rd week of a Chuck Wendig challenge, whereby I pick up a story that has been 2/3 written by two other followers of terribleminds.com and write the conclusion. I took on an interesting tale begun by JD Stoffel and continued last week by Lisa Shininger. We were each to do 500 words. I only ran over by about 50 words. Incidentally, I had to look up "eschaton" so you can too. I'll add a link to the story I continued last week as soon as I find an ending for it. Charlotte, the Senior Reaping Manager, shook Reap’s shoulder, jostling her blanket of cobwebs aside. “Not Xanaxes,” Reap groaned, sliding the cloak over bony shoulders. Brushing aside the compulsion to come down on Charlotte for bossing around her boss, Reaper swung her scythe. The blade hummed through the air and through the fabric of reality at just the angle necessary. A tear opened and Reap passed through. She stood in a city park. Her reaping staff was in evidence. They stood by, waiting for buildings to fall, meteorites to strike, the ground to swallow people whole. “Ronald, uh,” Reap called aloud, then squinted at the pages. “Ronald Passitelli?” She botched the pronunciation, but it got the attention of a passing low-level reaper. With a relieved sigh, Jim swiped his scythe to reach the Below. Reap paid him no mind, focusing on the now-identified Ron. Ronald Passitelli stood ankle deep in the large basin of the fountain. A bland young man in a dress shirt and khakis, now soaked, he reached out toward a child. The child took refuge from the hell raining down from the sky in the bulky fountain sculpture. “Where’s my mommy?” cried the child. “Ronald,” Reap boomed in a voice only moderately intimidating. She did not want to blow the man’s simple mind. Xanaxes wailed, so Ron turned his vacant expression on the fake toddler instead. “Oh, come on.” All these humans ever did was gawp at things. Reap whipped the sleeve of her cloak around her bony hand and tugged on the back of Ron’s shirt to pull him out of the fountain. It took just a flick of the scythe’s handle against Xanaxes’ curly dark head for the god’s body to slacken and drop back into the fountain. Reap tightened her grip on Ron’s shirt and lifted him clear. You would think that "you’re the only one who can stop it" covered all the bases. You couldn’t assume anything with humans, though. Ron dropped to the ground like a sack of meat. Reap slashed at the air beside him. “Abs, turn off the heat. Live one coming through!” she called, before twisting the scythe to open the seam to the pit enough to let Ron drop through. Her aim wasn’t the greatest. They slipped into the next world a few inches off an ash-strewn floor. It crunched lightly under Ron’s body. Abaddon stood a few feet away with his hand still on the shut-off valve. His chitinous skin gleamed. His black eyes did, too. His wings, his robe, the army of locusts screeching behind him. In fact, everything down here gleamed, like it was all covered in a thin film of oil, which it probably was. "Stop scaring him," Reap said. "He'll do what he has to do." "Don't count on it," Ron said. He was looking around now, and seemed to be developing a backbone. What rotten timing, Reap thought. If the fellow didn't take the jump, she was going to be stuck processing souls for eternity. And then there was the paperwork for dealing with an apocalypse. Plus the trouble she was in for using her scythe in an unauthorized manner. Several eternities. Ron whoever he was didn't look like he cared about her problems. "Come on. We're going to find Lucy, and find where you're supposed to jump." He planted his feet stubbornly. "I'm not jumping off anything, and you can't make me." Drat! The toddler god really had gotten him. The man's simple face had taken on that look, the one small children got when defying the adults who were just trying to keep them alive. Though in this case Reap wanted him dead, which he was going to be no matter what. She just wanted to make sure he did it in the way that would stop the Apocalypse and save her a few millennia of paperwork. She hoisted him by the scruff of the neck. "Let's go." She could take him to the brink, and did. The hitch was, he had to take the leap himself or it wouldn’t work. She started talking, working on his sense of public duty, destiny, fame, whatever. They were standing about ten feet back from the brink now, Reap running arguments at top speed and checking the eternal clock every third word. “Time’s running out, you fool!” Reap snarled it. “You’re dead no matter what, but if you don’t charge over there and jump in the next 30 seconds, so is every other person on earth.” She finally had Ron’s full attention. It wasn’t strictly true, but close. “Yes!” He’d be dead soon enough, even if he didn’t jump, so it wasn’t a lie. “If I’m dead it won’t hurt.” He didn’t phrase it as a question, so Reap didn’t have to answer. That was good, because lying to the Sacrifice meant more paperwork. He took a few wobbly steps toward the brink, and stood there, unable to make the leap. 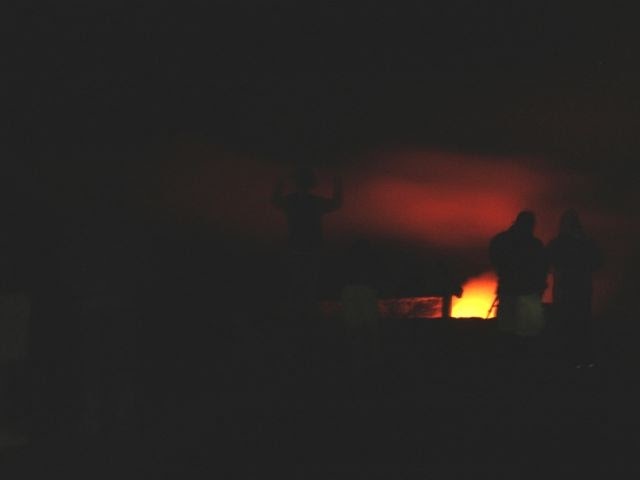 Ron might believe he wasn’t going to notice when he dove into the lava. But on some level his body knew better. He was going to funk it. Reap could see that. She stepped up closer behind him, seeing his knees were shaking with terror. She couldn’t push him. But she could encourage him. “Watch out! Snakes!” She screamed it as loudly as possible, and it worked. Ron leapt instinctively out of the way of the snakes…and went over the edge. 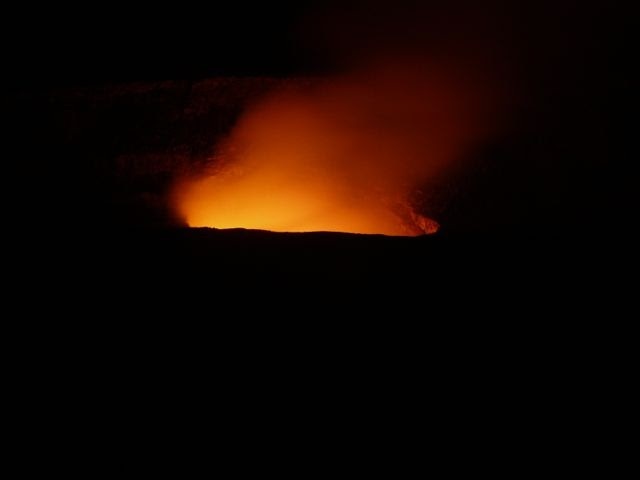 Reap took a look into the pit, which flared and belched. It was working. She turned. Five Junior Reaping Managers stood by the door, arms loaded with piles of paper. With a deep sigh and a repentant bowing of her head, Reap led them to her office. Four piles of souls to process, and another, larger pile, to explain her illicit use of the scythe. “I’ll be here forever,” she moaned, taking up a quill. It has been a long time since I devoted a post to talking about writing. Long enough for people to forget that writing books is what I really do, rather than reviewing them (though obviously reading books is what I spend the most time doing, and I don't even review everything I read!). So it was perfect that I got a tag this week from fellow Goodreads author Heidi Chandler to take part in the Work In Progress Blog Tour. The rules go like this: Provide the link back to the post by the person who nominated you (see above). Write a little about and give the first sentences of the first three chapters of your current WIP, then nominate a few other writers to do the same. So my first job was to decide which WIP to write about. I'm currently in final edits on my humorous middle-grade fantasy, Halitor the Hero; in early edits on the second Pismawallops PTA mystery, Death By Trombone; and starting to draft stories for a third Ninja Librarian book, which doesn't even have a title yet, though I think of it as "The Problem of Peggy." Since only one of those has a clear first three chapters, the choice was pretty easy. And I here realize that I haven't yet done any of my homework--writing blurbs and summaries and all that. Here's my chance to start! Young Halitor has failed at every possible career for a peasant lad in the lands under the Ice Castle when his parents manage to foist him on Bovrell the Bold as an apprentice Hero. But he's no good at that, either, and when his master abandons him at an inn in Loria, he would be willing to settle down to being a kitchen boy, as long as they feed him. But Melly, the kitchen wench, has other ideas. Soon the two have set off on a journey to try to find her father. What Halitor learns along the way is a lot more than just how to be a Hero. A girl’s scream sounded through the afternoon, and Halitor clutched his sword in a sweaty fist and reined his horse to a halt at the edge of the forest. Once Melly had gained some skill with the sword, she began to suggest that they needn't stay on at the Drunken Bard. 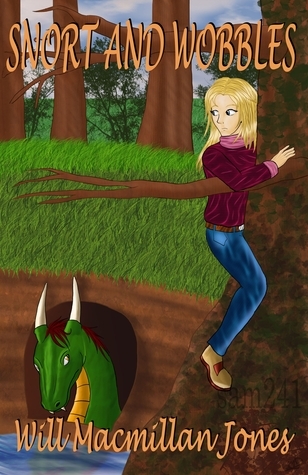 Melly clutched Halitor’s arm and pointed into the woods. A pair of small ogres looked back, growling and gnashing their teeth. (Okay, I cheated on that last one and put the first 2 sentences). And I still need to do a post about writing! On a housekeeping kind of note, I've looked at my last few reviews and decided I need to take a break from reading and reviewing kids' books and reset my grump-o-meter. I'll try writing more short stories, posting more photos, and talking about writing until I feel more objective. The Dragon Fyre Blade: Lycanthor the Werewolf is the first book in a series of six and is written for children 7 – 11 years old. I admit I wasn't sure at first if I would like this. The opening scene was a little violent, and then the story was revealed to be of the normal-kid-falls-into-fantasy-world type. There is absolutely nothing wrong with that. The Narnia books follow that pattern, for Pete's sake. But I've been feeling a little tired of it, so I was a little biased as I began. Storm's fast-paced writing blew away that prejudice for the most part. The action is gripping, but I think the author found a good balance between believable peril and too much intensity for the younger children. I would say that my biggest issue with the book is that characters and relationships aren't adequately developed. The book is so short (under 70 pages per my electronic copy) that there is little time to explore Jack's confusion at finding himself in a new world, let alone give us a clear sense of Jasyra and what she is thinking or feeling. What the story didn't do to keep my attention, the illustrations did. McCartney Leopardi's line drawings are vivid and active, and Lycanthor is truly frightening. The full-page black and white drawings add a lot to the pleasure of the book. It's easy to see how and why the story is being broken into six books--one for each piece of the blade. But this first piece is found quickly enough to make me wonder if the whole story couldn't have been made into a single book, or a trilogy of books at a more typical length for the age range (at least the upper part. Ages 7-12 covers a wide range of reading levels). To me the book read more like a short story, or an early chapter book. I think this will be enjoyed by fantasy fans of all sorts, but I would say it is especially suited to the younger end of the middle grades--say ages 7-9. Full Disclosure: I was given a free electronic copy of Lycanthor the Werewolf in exchange for my honest review as a part of a Mother-Daughter Book Reviews book review blitz. The opinions expressed are my own and those of no one else. I am disclosing this in accordance with the Federal Trade Commission's 16 CFR, Part 255: "Guides Concerning the Use of Endorsements and Testimonials in Advertising." I'm gradually getting photos in order, so I thought I'd jump back into the Friday Flash Fiction with Chuck Wendig's weekly challenge. This week, the challenge was to continue a story begun last week by another Wendigo. 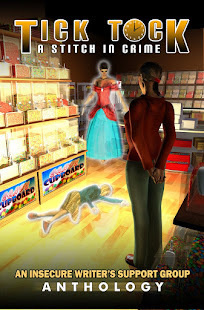 I selected Jemima Pett's fun mystery, "Half a Clue." Just because he can, Chuck changed the rules on us after the first week, so Ms. Pett's half a story is now 1/3 of a story. Or whatever he insists on. I complicated things enough for several more 500-word segments if needed. Oh, and I finished early, so my Friday flash goes up on Thursday. So sue me. The last thing Scarlett expected to find that morning was a dead body. Despite, or perhaps because of, the excitement of the previous evening she had not slept well. The stuffy old dinner party had turned out to be so much more. As usual, she had been seated next to the vicar, and his groping hands had strayed to her thigh on several occasions. Her mother had asserted some years earlier that little girls did not tell tales, especially about such a respectable person. 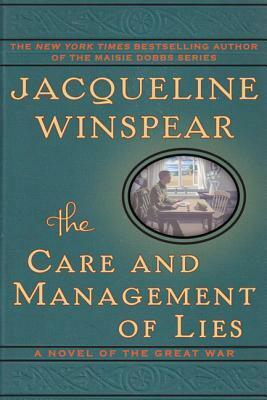 On maintaining the truth of her allegations, she had been sent to her bed without supper for five consecutive days. She had learned to endure and avoid as a result. The only person she had confided in was Alba White, the cook. To her immense relief, Alba just nodded. “Say nothing more,” she had advised, and gave her a signal to give to the butler. On the next occasion the vicar’s attentions became too intimate, Scarlett acted as planned, and the reverend was mysteriously taken ill after the sweet course. Last night it happened again, and Scarlett hoped the man of a different god than hers could see it was divine retribution. She had thrown off that mischief after dinner. Russell Peacock, home from the war, and his mother had been the centre of attention. Russell only had five days leave, but he looked so handsome – and so grown up since their last meeting in the summer. They had known each other since childhood, of course, but there was something so different about him now, it made her heart fizz. Even their entrance had been exciting. Reeves had announced them, of course, but as Russell had shaken her father’s hand his eyes had turned to her, that sudden spark shooting through her, confirming his thoughts were on her as much as hers were of him. He had done his duty to the rest of the company, of course, and he and Scarlett had only minutes together before dinner was announced, minutes that Scarlett had dissected and savoured in the early hours when she was trying to sleep. Of course, she also examined the scene that, having simmered throughout dinner, finally erupted afterwards. How dare the stuffy old Colonel disagree with Russell about his analysis of the Hun? What right had he to call Russell a ‘young pup’? Scarlett thought Russell had been most heroic in the way he controlled his rising embarrassment tinged with ire. The Colonel was drunk even before he arrived, or so she had heard the professor whisper as he gently led the old soldier onto the terrace after the meal. Scarlett’s only regret about the evening was its premature ending; Russell and his mother had to return early to nurse his sick father. So much for Scarlett to think about. No wonder she had risen early to see the dawn. It had just been the last thing she expected to find: Colonel Mustard, in the library, a revolver by his side. Scarlett drew in a breath to scream, then thought better of it. A scream would draw the whole household, blustering or hysterical as their personalities dictated. She closed her mouth and rang for Reeves. “He’s been taken dead.” Surprised at her own calm bluntness, Scarlett stepped aside to reveal the corpse on the library rug. Reeves sniffed his disapproval, of bodies messing up his rugs and of young ladies finding them. An hour later, Inspector Clueso had them all lined up in the lounge. A pair of policemen, or surgeons, or something, worked over the thing in the library. Scarlett had blurted out the news as soon as they were gathered, of course. Colonel Mustard was dead in the library, with a revolver at his side. Speculation ran wild. Whose revolver? Had he shot himself? Had someone else shot him, and left the gun to make it look like suicide? Who could have hated the old army man that much? People got annoyed with the Colonel, with his rambling stories and his dogmatic pronouncements, but they didn’t generally care that much what he said. Scarlett hadn’t mentioned what her quick look at the body had shown her: that the gun had not killed the Colonel. And she very much doubted he had killed himself. Not that way. Scarlett avoided looking at Reeves. She was sure the Vicar had felt very ill indeed. Scarlett glared at him. How dare Professor Plum hint that Russell could have had anything to do with it? She thought of the Colonel’s blustering dismissal of all Russell’s opinions about the war. But Russell had kept his temper so beautifully! And anyway, he and his mother had been long gone before this had happened. Well, the Inspector would have to figure it out. At least so far he’d been smart enough not to mention how the man had really died. Publisher: Harper, 2012. 305 pages. Ivan the gorilla lives at the Exit 8 Big Top Mall, a sort of odd cross between a zoo and a mall, and he's lived there so long he almost thinks it's normal. Until, that is, Ruby the baby elephant arrives and reminds him of all he's tried to forget. Okay, there's no denying this is a good book. It won the Newbery Medal in 2013. It's moving, and brilliantly done, and makes us see and feel what Ivan sees and feels. I think the style of writing and the format (it's laid out with each page a separate chapter, almost like a journal entry, and each sentence it's own paragraph) gives it a bit of a feeling of otherness, or the recording of thoughts. And yet (I'd better prepare to duck here): it didn't really move me that much, and I kept wondering what the point was, besides a lesson about cruelty to animals. I'm almost wondering if I should read it again to see what I missed, but I don't think so. I get the message, and I'll even go so far as to say we could extrapolate to thinking about man's inhumanity to man. But as a story, it felt thin. Maybe I just wasn't in the mood for something with more poetry than plot. I also had a problem with a book that is both trying to be realistic on one level and yet depicts decidedly anthropomorphic animals. I get it: we are being reminded that the animals, especially ones like gorillas and elephants, in fact have feelings, and I don't doubt that they do. But I was put off by their conversations, and for some reason especially by the cynical speech of Bob the stray dog. It was just a little to human and knowing. In spite of my reaction, I think this is a good book, and worth reading. Its message is important and clear, without totally beating us over the head with it. I suspect it would make a very good read-aloud, though it might be hard for younger children to cope with the cruel realities it depicts in places. 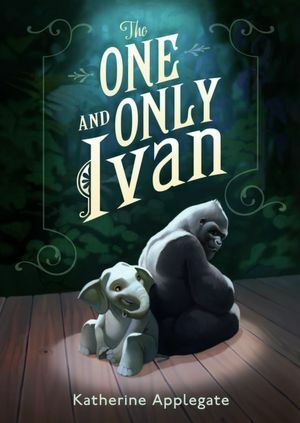 Full Disclosure: I checked The One and Only Ivan out of my library, and received nothing from the writer or publisher in exchange for my honest review. The opinions expressed are my own and those of no one else. I am disclosing this in accordance with the Federal Trade Commission's 16 CFR, Part 255: "Guides Concerning the Use of Endorsements and Testimonials in Advertising." I'm a little late with this. . . so sue me. I was out hiking again (coming soon: photos from California's Sierra Nevada). 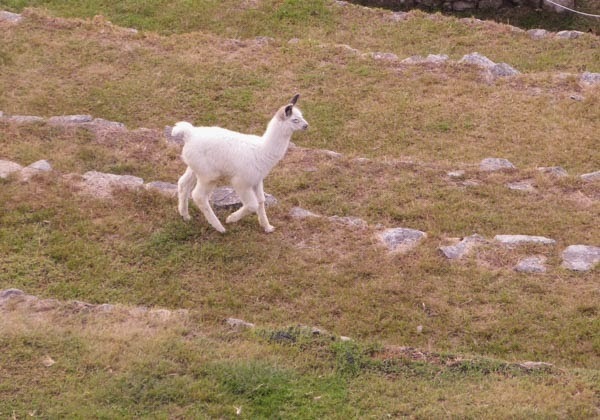 One last Peruvian photo essay. After all our trekking, we opted against walking to Machu Picchu, instead taking the planes, trains and automobiles approach. At the end of the Huayhaush trek we rode our bus straight back to Lima, where the party split--two to fly home, the other 6 of us to leave the next morning on a flight to Cuzco. The bus ride was long, but had its own scenic interest, from the agricultural to the dismaying. Orange peppers drying on a hillside. The road runs along the coast for a very long way, with huge chicken farms here and there. 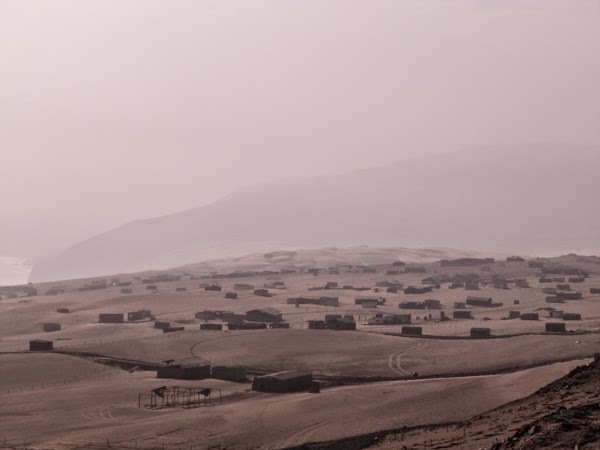 The workers lived in scattered shacks on the completely bare sand dunes. It really doesn't seem possible to live there, where nothing grows and all water must be imported. The flight to Cuzco next day was fairly short. 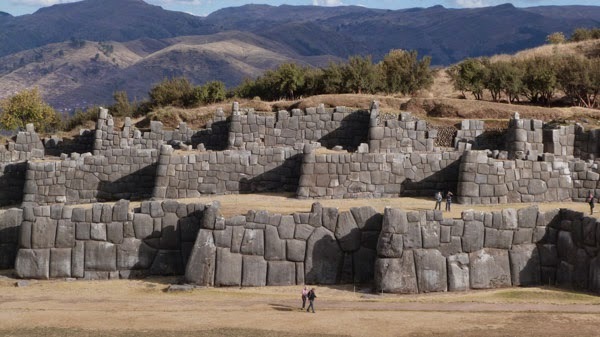 Cuzco is an ancient city which has made itself over very firmly as a tourist mecca. 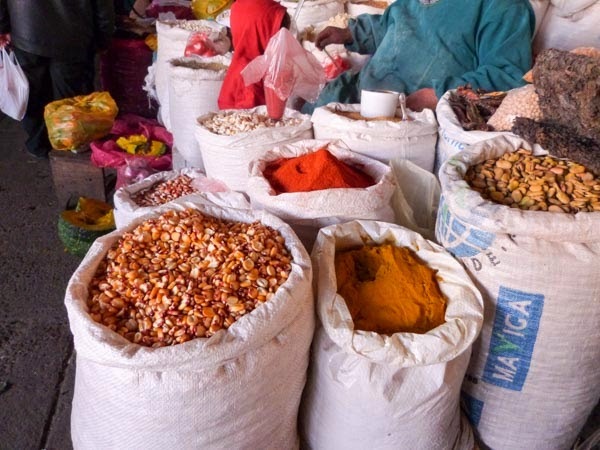 The central market, though, was loud, colorful, and smelly, and clearly more patronized by the locals than tourists, probably with good reason. Corn and other grains for sale. 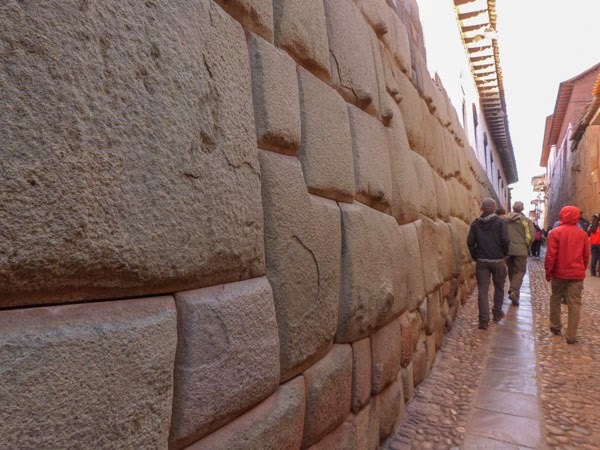 Many streets were narrow, and ancient Inca walls might show up anywhere. The Inglesia de Santo Domingo was built right atop the Incan temple of Qoricancha (after looting, of course). 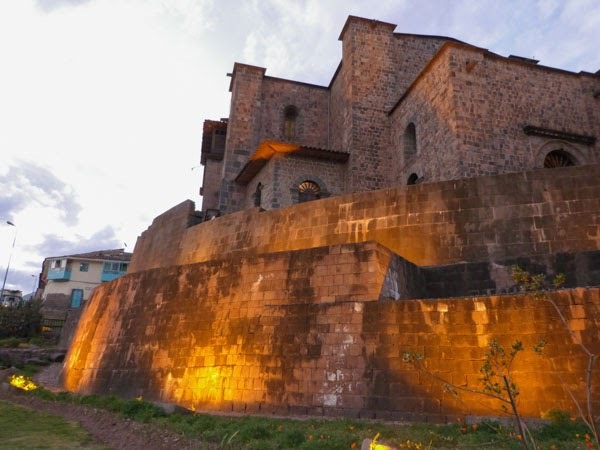 The lower walls are the work of the Inca, with the Spanish church above. 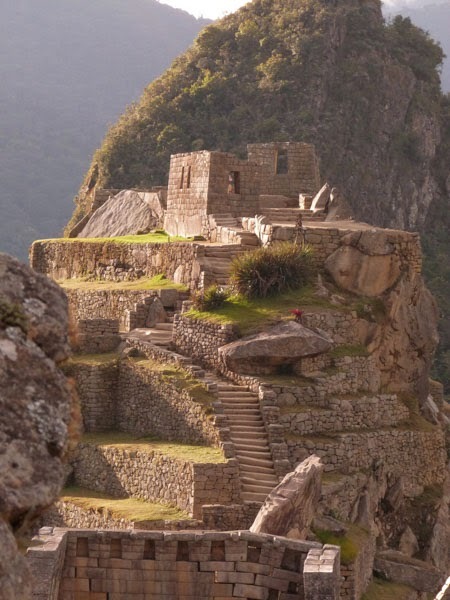 Many of the old bits were left in place, and the Spanish made good use of the superior Inca stonework. 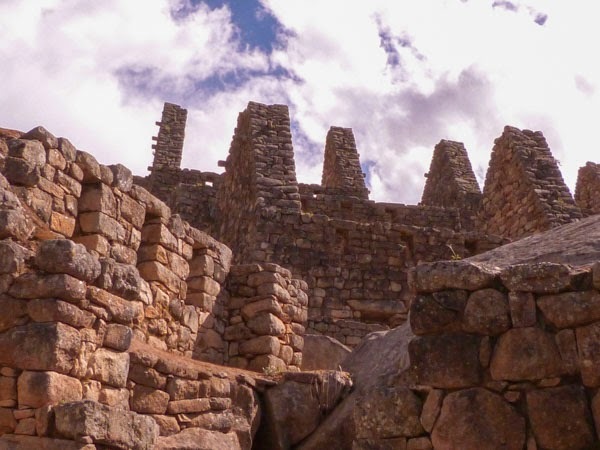 Before heading to the Sacred Valley and Machu Picchu, we spent a day visiting the local sites and sights, including the ruins at Saqsayhuaman, a huge complex and the site of one of the most devastating losses the Inca suffered at the hands of the Conquistadors. 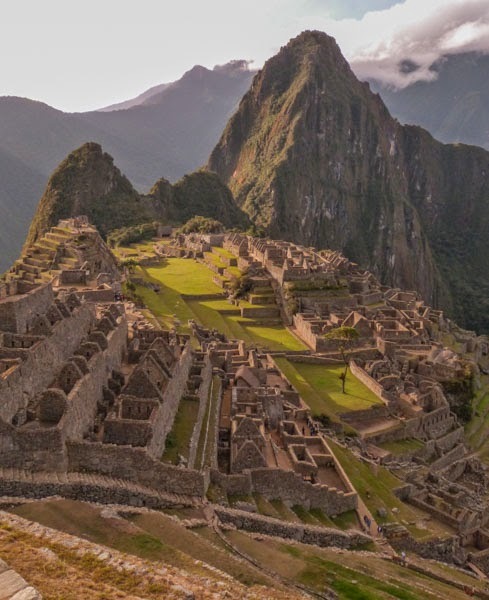 From that defeat the Inca began the retreat to their hideout at Machu Picchu. Imagine the field before the walls covered, not with tourists, but the dead defenders of Manco Inca. 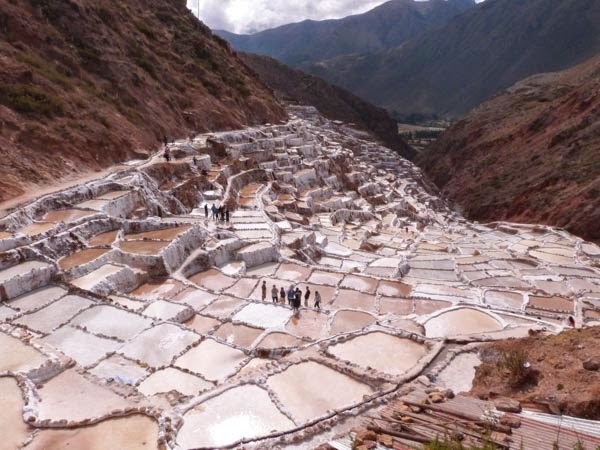 We took a private bus and driver to Ollantaytambo, in order to visit other key sites, notably the salt pans at Salinas, above Urubamba, which have been in use since Incan times. Many pans have been in the same family for generations if not centuries. Tourists and workers alike wander the narrow dams between ponds. 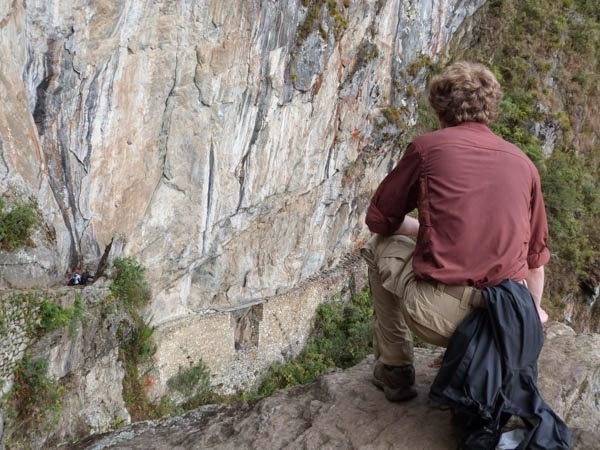 Logistics for getting to Machu Picchu are not trivial. 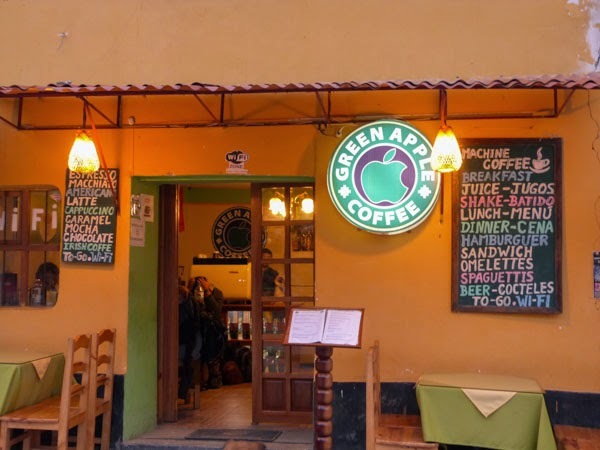 After our day in the van, we were deposited in Ollantaytambo, where we spent the night, leaving before breakfast to catch the train to Aguas Calientes. I could only admire the cafe, as there wasn't time to get anything. Nothing like borrowing from TWO major US companies at once! The train brought us to Aguas Calientes (at the base of the mountain bearing the ruins) mid-morning. Once checked in to our hotel, we had lunch, and headed for the mountain. 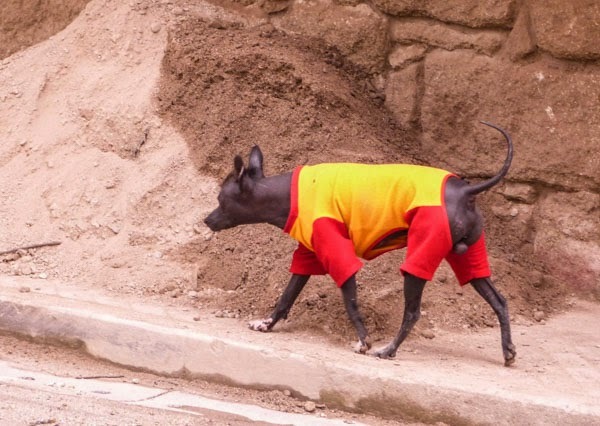 The area is apparently famous for hairless dogs--this one was wearing a shirt, though frankly I thought it was plenty warm out! Can you say 'ugly dog'? Most of a mile from town, we began the climb, roughly 1400' (and as many stair-steps) up from the town. After our time in the high mountains, the altitude (about 8000' at the start of the ruins) was nothing, but the heat and humidity took a serious toll. Hotter 'n snot and we still had to carry rain jackets, because the weather can change fast! 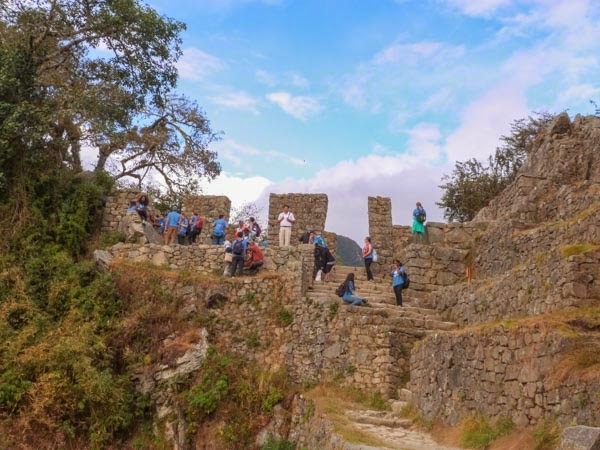 When you reach the ruins, the climb isn't over--the Incas built on slopes! 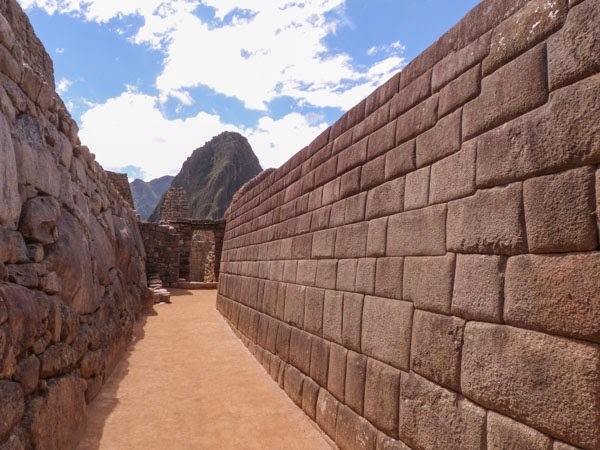 We trotted out to the Inca bridge, where they deliberately built a gap into one of the approaches, forming a drawbridge, as they needed only remove the boards across the gap to make it nearly impossible to approach. 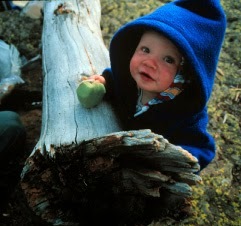 The nephew (who unlike me is not afraid of heights) contemplates the trail, which is closed to hikers now). 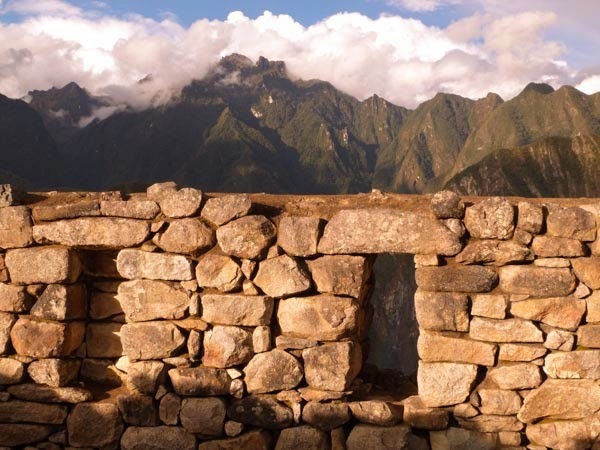 We then headed up to the Sun Gate, where the Inca Trail enters the ruins. 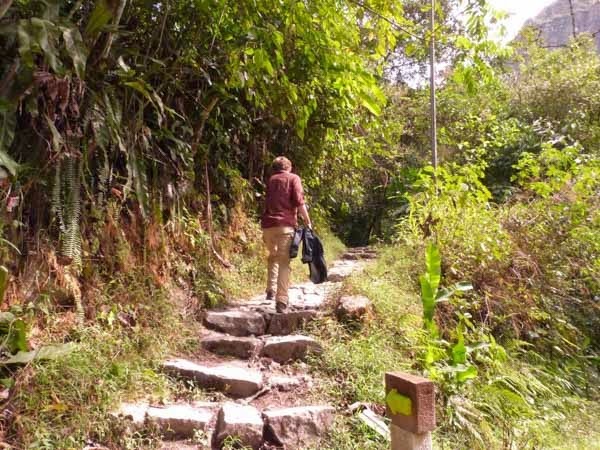 You can get off the train a few miles from Aguas Calientes and hike the last bit of the trail to enter this way, which seems like a worthwhile idea. Shortly before closing the sun broke through and gave us a look at the city and Huayna Picchu, the classic photo. The second day, our sons climbed the trail to the top of that peak, though due to a mix-up the adults in the group were unable to get tickets. More beautiful light as the clouds blew away. I like the contrast in styles of construction. Religious and royal buildings got the carefully dressed stone. Since we couldn't do the standard climb, the adults in our group chose on Day 2 to do the much longer climb to Montana Machu Picchu, at over 10,000'. This made a LOT of climbing for most of the group, who walked up from town. I rode the bus to the base of the ruins that day, as I'd spent part of the night throwing up (remember the comment about the heat and humidity? Dehydration is no fun). The bus ride was less effort, but extremely terrifying, and those with weak hearts might do better walking. Amazing views from the mountain top, and a limited number of people make the climb, admittedly with good reason--2000' of stairs is no joke. A VERY long way back down to the town, just at the bend in the river! Back down in the ruins, I was charmed by the animals! 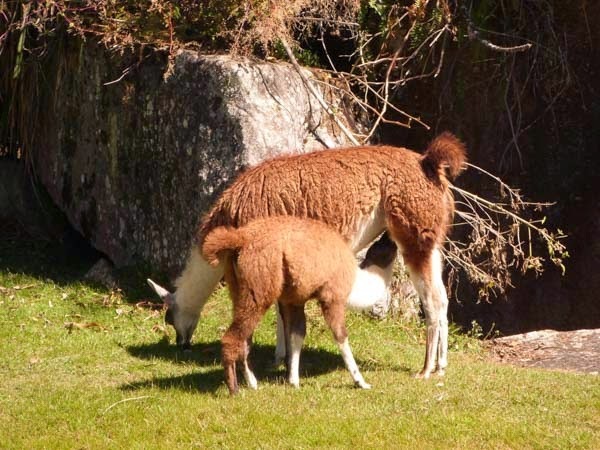 Lawn care is provided by a herd of llamas. The herd is increasing. Double feeding time! The llamas are domesticated animals, but the biscachas (or viscachas) are "wild"--habituated, but not domesticated. Relatives of the chinchilla, they look a lot like rabbits but have long furry tails. 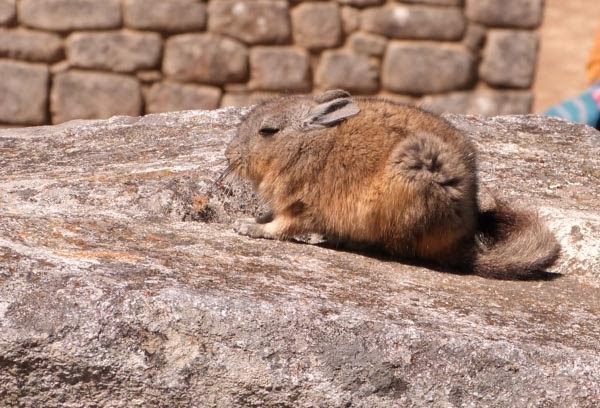 They live all through the ruins, which make a great habitat for animals that naturally live in rock piles. Lots of miles of hiking, and all over now. 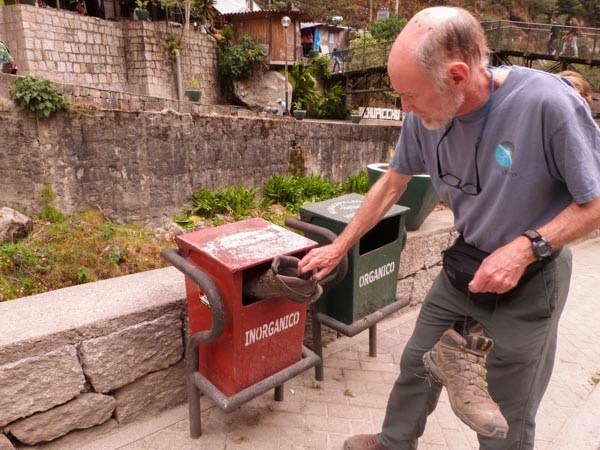 . . my husband's boots didn't quite stand the gaff, and he took great pleasure in depositing them in the trash before boarding the train to begin the long trip home! Back down from the ruins by early afternoon, we boarded the train at 3:30. Our driver picked us up in Ollantaytambo at 6, and we bused back to Cuzco that night, arriving for a very late dinner. After a night spent, in the case of some of us, in much digestive distress (you really don't want to know more), we flew to Lima, spent another night, and finally flew home, with an 8-hour layover in Mexico City. Home has seldom looked so good! 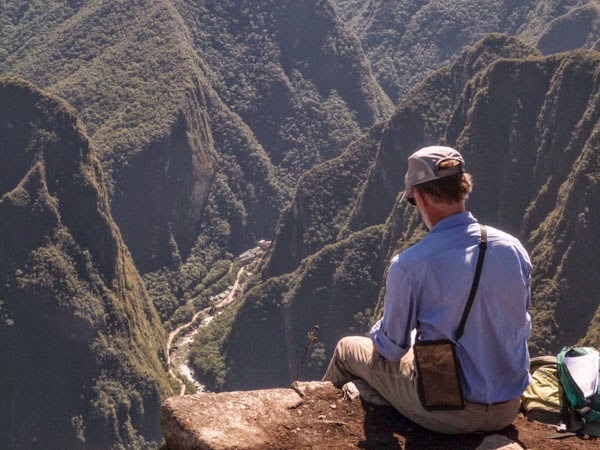 (Pity my brother-in-law, who had to get up next morning and drive 3 hours before he was home, making for four days on the road from Machu Picchu to his own bed). To see the rest of the story, follow the links from my Photos and Travel page! Middle school is a challenge, so when class loser Dwight starts talking to his origami Yoda finger puppet, the first reaction of the 6th grade is inevitably ridicule. But when Yoda starts dispensing good advice and saves one of his pals from total humiliation on the romance front, Tommy starts to think maybe there's something in it. So he assembles a casebook to try to collect and weigh all the evidence, and we can decide along with him whether Yoda really has the power of the Force or Dwight's talking through his hat. Or his finger. This was an entertaining look into the heads of middle school boys (though with a comment like that, you might think it was horror instead of comedy!). It is short, with very short chapters, each written in a different voice, so it should work well for reluctant readers and those with short attention spans (parents, maybe?). The format is essentially episodic, with each chapter and independent story of one student's experience with Yoda, building to a final decision Tommy must make to follow Yoda's advice or not. The book is not substantial and offers no brilliant insights, but I had fun reading it (and trying to make the Yoda, though my results were. . . sad). .
Take it or leave it. Not a must-read, but rather a book that can be enjoyed and might help a kid learn to like reading. But if you fold Yoda and he starts talking to you, I recommend taking a long step back! Full Disclosure: I checked The Strange Case of Origami Yoda out of my library, and received nothing from the writer or publisher in exchange for my honest review. The opinions expressed are my own and those of no one else. I am disclosing this in accordance with the Federal Trade Commission's 16 CFR, Part 255: "Guides Concerning the Use of Endorsements and Testimonials in Advertising." Publisher: Scholastic, 1996. 181 pages. Mila is found on an atoll, and she has been raised by dolphins from the age of 4. When she's taken back to the US, Mila has a lot of learning and adjusting to do, and it doesn't help that the government claims her as a legitimate study subject, rather than as an adolescent with human needs (as well as some rather dolphinish needs). 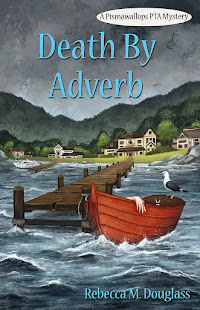 Karen Hesse is a fantastic author, and I believe this book won some awards, but I have to admit I didn't really like it. The premise was a bit hard to swallow--exactly how did that work?--though if that is once accepted, the results are logical enough, I guess. The narration is interesting, in the voice of Mila, as a sort of journal. As she learns more and more language she is able to express herself more clearly and we also see her developing a grasp of human nature. The ending of the book is the source of a large part of my dissatisfaction. Without giving anything away, I will just say that I found it unrealistic and unconvincing as a long-term solution. Having truly loved many of Hesse's books, I was sorry to find myself unimpressed with this one. The book is a quick and engaging read, for those (children?) more willing than I to suspend disbelief. For any reader, it is an interesting insight into human nature, from the perspective of a virtual outsider. Full Disclosure: I checked Music of Dolphins out of my local library,, and received nothing from the writer or publisher in exchange for my honest review. The opinions expressed are my own and those of no one else. I am disclosing this in accordance with the Federal Trade Commission's 16 CFR, Part 255: "Guides Concerning the Use of Endorsements and Testimonials in Advertising." Don't miss the Pismawallops PTA Back-to-School sale! Ebook just $2.99 until Sept. 10. Visit Amazon or use coupon code PJ97S to get the same price from Smashwords, which sells all formats, including Kindle, Kobo and Nook. I think I'm getting my mojo back. This week's story came to me at the sight of a "lost cat" (or maybe dog) poster glimpsed while I was biking. I'm pretty sure the pet's name was Dahlia, and I couldn't help thinking that was a name to offend a cat. The story unfolded itself from there. And next week's story again grew out of something seen while out riding. I guess I need to ride more to write more? In any case, it's nice to have the ideas flowing again, though not necessarily coming from the usual prompts. On a grey and gloomy day on moderately quiet street in a medium-sized town, a woman of more or less middle age moved from lamp post to lamp post, taping up signs. Each featured a photo of a large marmalade cat and read, “MISSING CAT! Dahlia is lost! She is lonely, cold and scared. Won’t you help me find her?” and gave a phone number to call if the cat was seen. The woman shivered as she worked, and drew her sweater more tightly about her shoulders. Meanwhile, across town on a rather less quiet street, a large marmalade cat relaxed in a nightclub, enjoying the scene. Word of the notices came by roundabout means. The small furry dog who lived three houses down from Dahlia and the woman saw the notices, and told Tom, the feral cat who stole his kibble, and Tom told the bird known as Shut-up-you-dirty-old-bird. Shut-up lived at the nightclub and came right home to tell Dahlia. Killer Instinct nodded. It was true. The nice lady, who really was good at opening cans of cat food, and even handed out dog treats if you shook hands or did anything silly like that, wasn’t very observant. She tended to think of all dogs as “he” and cats, like boats, as “she.” She had never noticed that Dahlia was, in fact, a male cat. Before Killer Instinct could offer any suggestions, a door opened nearby, and a voice called into the night. Killer I. tried not to look at the cat, and trotted off. “Dogs,” muttered James Dean. “Always thinking with their stomachs.” The cat formerly known as Dahlia stalked back down the street, tail erect. “Anyone who called me ‘Fluffers’ would live to regret it,” was his final take on the matter, though no one was present to hear, Shut Up having stayed at the nightclub to get his beauty sleep. And yet. As James Dean, Feline Rebel, made his way back across town to the nightclub, he couldn’t help thinking of The Woman. He knew what that poster meant. Sooner or later someone would recognize him. What was she thinking, saying he was scared, anyway? He wasn’t scared of anything! The Speakeasy wouldn’t open for hours, but the cook at the diner on Main Street always gave him a sausage when he came around, so he hung out there in the mornings, working the breakfast crowd and napping in an empty booth when business was slow. Late morning, he moved to the Café three doors down, and napped in their front window. The staff there thought he added a classy touch. Mid afternoon, he headed back toward the Nightclub. It wouldn’t open for hours, but he could get in some quality napping before the music started. But when he turned onto a side street, his eye was caught by a poster. One of his posters. So The Woman had ventured this far from her easy chair and her lace curtains for him! He thought that ought to make him feel something. He remembered, too, that she had a grand way with a can opener. Slowly, he found himself turning toward the old neighborhood. “And she has a can opener,” the bird mocked. He and the cat turned at a low growl. “Nuthin’ wrong with that.” Killer Instinct kept his voice as low and rough as possible for a small dog with—James Dean couldn’t help but notice—very fluffy fur and a diamond-studded collar. “It's a bit dull there, though,” James Dean said. He thought about the music and dancing at the nightclub. He particularly liked the lights that made spots run all over the floor. “You gonna keep running off?” Killer Instinct asked, forgetting to keep his voice low and gruff. Killer I. and Shut Up pestered James Dean all the way home, but he wouldn’t tell them his plan, and they had to leave when he reached the little house and The Woman with the can opener. James Dean would have preferred to walk right in, or at the least knock on the door in a confident and domineering manner. But since the door was closed and he was a cat, he settled himself on the doorstep and yowled. Afterwards, James Dean preferred not to think about the greeting the woman gave him, alternately hugging and scolding him, though she also opened a can of fancy tuna for him, which went a long way toward erasing the offense. The hard part came later. He kept an eye on the time, and at the right moment—he got a bit of luck here, as The Woman went into the front garden to mess about with her flowers—he made his move. James Dean followed her out, and, making sure she was watching him, trotted out the front gate. “Oh, stop, you bad cat!” she cried, and trotted after him, dropping her clippers on the walk, but clutching her huge hat to her head as she went. James Dean made sure he went just fast enough to keep ahead of her without losing her. He could hear the music from half a block away, and they were playing his song. He headed for the front door, where a man seemed to pick who could come in and who couldn’t by looking at little bits of paper. James Dean darted between his legs into the main room. “Johnny?” The Woman sounded very confused. “She’s a he, ma’am. Sounds like he’s been living with you under false pretenses.” He seemed to find this very funny, and laughed loud and long, but The Woman did not laugh. By now the manager had come up and she turned to him. “Does she—he—come here often?” She pointed, and he broke into a grin, seeing Johnny dancing with the sparkles. “Oh!” she gasped. She stood there in her nondescript slacks and sensible shoes, and the foot inside one of those shoes began to tap. Then the other. Then, with a sudden laugh that made the manager think she wasn’t so old after all, she moved onto the dance floor, matching her moves to the cat’s. James Dean/Johnny Travolta looked around and spotted the parrot watching them. “Well, Cat, you did it,” the bird cawed. “Shut up, you dirty old bird,” someone shouted. The cat gave a small, satisfied “meow” and went on dancing with sparkles, his Human following obediently. Wobbles is eight years old and feeling a bit out of things as the family (Mom, Dad, older brother) adjusts to a new home. When she wanders to the end of the garden by the creek (where she's not supposed to be), she finds some surprising friends--Snort the Dragon, a talking rosebush, and more. And when her brother goes missing, they go to the rescue! The book is well-edited, meticulously proof-read, and formatted well, with no issues on my Nook. This book is for younger elementary age kids, in keeping with the 8-year-old protagonist and the brevity of the story. It is also for anyone who loves the absurd, and is happy to take dragons and more in stride. Full Disclosure: I bought Snort and Wobbles of my own free will, and received nothing from the writer or publisher in exchange for my honest review. The opinions expressed are my own and those of no one else. I am disclosing this in accordance with the Federal Trade Commission's 16 CFR, Part 255: "Guides Concerning the Use of Endorsements and Testimonials in Advertising." In this 3rd book about Scotland Yard's Adam Dalgliesh, the DI has come to spend a quiet holiday with his Aunt Jane. But no sooner has he arrived than the neighbors show up to complain that one of their number, mystery writer Maurice Seton, has disappeared. And then the local police show up to say he's been found. . . dead and mutilated. Dalgliesh has no official standing on this case, but he can't keep out of it, and naturally finds his way to the solution before the local police, but not before there is another death. The 1967 publication date explains a great deal about this book, which did feel dated in some ways. 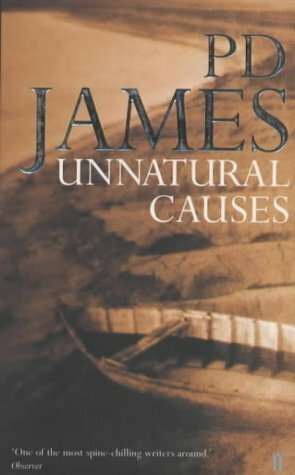 Jame's style is always a bit formal and distant (rather like Dalgliesh, actually), so as I was listening I wasn't sure about the time period, but felt that the story had a tone that was out of step with modern novels. It did seem to be set in another era, and several things make a great deal more sense in that context! Not surprisingly (James is one of the masters of the genre), the plot is complex, but not byzantine, and hangs together beautifully, with all the clues present in retrospect, though I didn't see it coming. There was one annoying point when Dalgliesh tells the local police the key to everything, and sends them off to find it, but we (the readers) are not told what it is. That always strikes me as a bit unfair, and frankly even if I had been told what the thing was I wouldn't have figured out who did it, so she might as well have played straight with us. Ms. Dellaporta's narration is excellent, and adds to the enjoyment of the story. As long as you don't have any issues with older mysteries with a more restrained style, this is an excellent yarn. I have tended to read this series in random order as the books cross my path, but I suspect a perusal in order would reward the reader, who could not only see the characters develop, but watch Britain and the Yard transform from the 60s to the early 2000s (without aging the characters any significant amount). If you are a fan of the classic mystery, have at it! Full Disclosure: I checked Unnatural Causes out of my (digital) library, and received nothing from the writer or publisher in exchange for my honest review. The opinions expressed are my own and those of no one else. I am disclosing this in accordance with the Federal Trade Commission's 16 CFR, Part 255: "Guides Concerning the Use of Endorsements and Testimonials in Advertising."